Combine the best of Niagara Falls during the day and at Night. 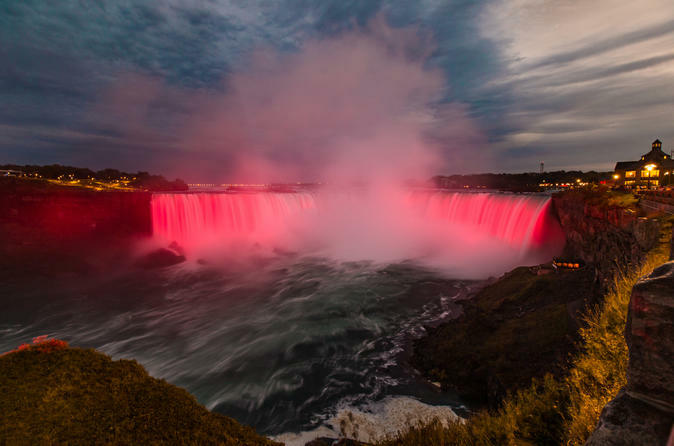 This tour includes the Hornblower Niagara Cruise, a 3-Course meal over-looking Niagara Falls and a behind the scenes opportunity to "Light up Niagara falls' Experience where over 200 years of lighting has been generated from. On evenings that have fireworks, the tour will stay to enjoy them light up the ight sky before returning to Toronto. Depart the city at 1:30pm with hotel pick up prior on this unique afternoon tour guiding you into the evening. The tour will start off as we head into the Niagara Region to a brief stop in Niagara-on-the-Lake. As we head towards Niagara Falls the group will stop at a local winery to savor some of Ontario’s best wines. Enjoy a relaxing dinner over-looking the falls before the grand finale. Your tour guide will take you up to the light house to get a rare and exclusive opportunity to Illuminate Niagara Falls. Experience over 200 years of lighting technology. You will have the opportunity to control the new state of the art LED lighting system projecting from the lighthouse onto all three falls before heading back to Toronto.